"Popocatépetl and Iztaccíhuatl" the volcanoes Popocatépetl ("the Smoking Mountain") and Iztaccíhuatl ("white woman" in Nahuatl, sometimes called the Mujer Dormida "Sleeping Woman" in Spanish) which overlook the Valley of Mexico. The most common variety relates the Nahua romance of the princess Iztaccíhuatl and the warrior Popocatépetl. This tale is recorded in several different versions. Popocatépetl is an active volcano located in Central Mexico, and lies in the eastern half of the Trans-Mexican volcanic belt. At 5,426 m (17,802 ft) it is the second highest peak in Mexico. It is linked to the Iztaccihuatl volcano to the north by the high saddle known as the Paso de Cortés. Popocatepetl is 70 km (43 mi) southeast of Mexico City, from where it can be seen regularly, depending on atmospheric conditions. 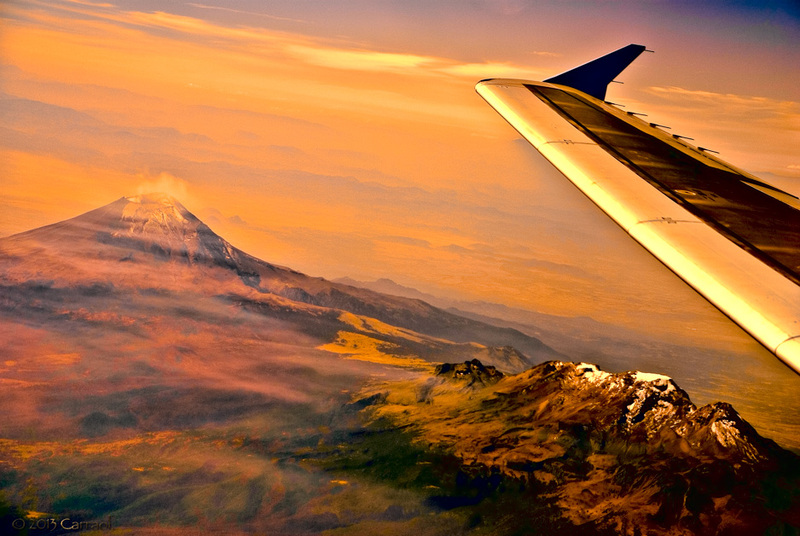 popocatepetl ! I learned that at school ! amazing shot Carraol ! I feel like a bird !